Patagonia is a successful outdoor clothing company and known by many as one of the leaders in sustainability. Yvon Chouinard, founder and owner of Patagonia, began his business life making and selling rock-climbing equipment in the late 1950s. Never considering himself to be a businessman, Yvon believed that he could grow a successful business by providing his customers with a quality product while still considering the wellbeing of the people around him and the environment. Patagonia is proof that it works. Without a business model to follow, Yvon started Patagonia. Guided by its mission statement Patagonia continues to grow successfully using the triple-bottom-line model; people, planet, and profits. Yvon was a pioneer for sustainable business best practices and continues to lead by example. In his book, “Let my People go Surfing”, Yvon Chouinard takes the reader through the journey of how he got started in the business, his challenges and successes along the way, and some practical insights on leading a successful sustainability-focused organization. 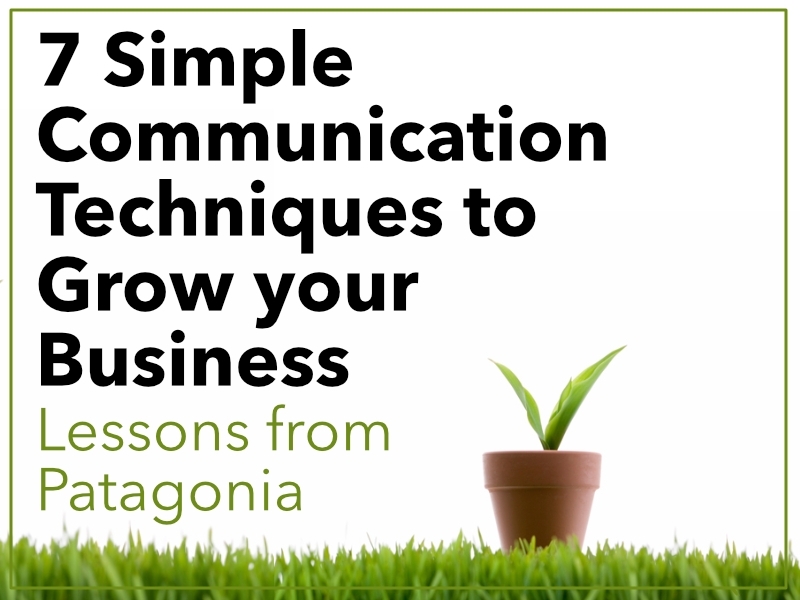 Frequently throughout the book, Yvon emphasizes the key role communication plays in Patagonia’s success. 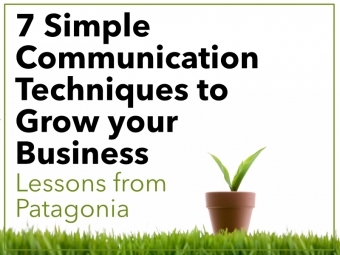 7 communication lessons inspired by the way they do business at Patagonia. 1. Show them, don’t just tell them. Telling someone that your idea is great isn’t always enough. One day, Yvon realized that the products he sold to his rock climbing customers were contributing to the degradation of the rock face. From that moment on, he set out to design and create a new device that would cause less harm. However, this meant convincing his customers that they had to change their climbing style and trust an unfamiliar product. Words weren’t enough. To show them it would work, Yvon and one of his young climbers went back up the Nose route on El Capitain using only the new product and technique. He didn’t just ask his team or his customers to accept something, Yvon demonstrated to everyone the value of his ideas through both his words and his actions. Patagonia mission statement didn’t come to form these exact words until much later on in the story. However, as you read Yvon’s book, it is apparent, that he had a clear vision for his business all along, and his values always guided his decisions. It was during a critical time in the company's growth that many of the understood values were put down into words, and educating the employees on those values also became a priority at that time. Lesson here: Don't wait until there is a crisis to create and promote your mission and values statement. Yvon surrounded himself with a leadership team and employees who shared his passion and accepted his values. By doing this, Yvon eliminated one communication challenge; having to convince people of the ‘why’ behind his decisions. He created a team that understood his vision, believed in it, and wanted to help build the company by being ambassadors for that vision. Kris McDivitt, who was the General Manager and CEO for thirteen years starting 1979, was a good example of that; in her position, she described herself as a “translator for Yvon’s vision”. Patagonia was consistent in communicating their values through actions and words. There were many changes at Patagonia that the company faced during its growth, but a lot of effort was given to keep in place the internal activities. These activities supported the cultural values that aligned with what the employees expected when they joined Patagonia. They were a casual company made up of mostly active, environmental people. They didn't come to work in suits; they preferred jeans and sandals. They believed in equal opportunity, so it was natural that they were one of the first companies to start a daycare program on the premises. Active living was important, so sponsored ski and climbing trips were common. By educating all his employees on the Patagonia’s philosophies, which were an expression of the established values, Yvon empowered his team with the guidelines needed to make the right decisions. Yvon believed it was important to communicate Patagonia’s values to their suppliers and contractors as well as their employees. “A problem anywhere in the system eventually affects the whole, and this gives everyone an overriding responsibility to the health of the whole organism." To promote effective communication, and grow the business at a manageable rate, Patagonia subscribed to the idea that, “100 people in one location” was a good size. It helped to keep it small enough to manage, promote personal accountability, and avoid bureaucracy. Patagonia’s marketing aimed to be honest. In a time when most companies were paying professional models for their product catalogues, Patagonia used photos of everyday people, both men and women, doing real things, while wearing their very own Patagonia clothing. In their general guidelines for marketing, Patagonia commits to inspire and educate rather than promote, chooses to put more value on word-of-mouth credibility than buying it, and only advertises as a last resort. Patagonia continues to push the 'status quo' of the typical business for the betterment of our environment. They offer programs like the 1% for the planet where proceeds go back to supporting local environmental projects, promote sustainable fashion by offering low-cost repairs to their clothing, and ensure ethical sourcing for their materials. Proving that they live up to their values, you need only to look back on Black Friday 2016. Patagonia made a bold statement by donating 100% of their store and online sales to local environmental programs - a record-breaking $10M in sales.